This is the python code I wrote of a simple crackme that I have reversed but I am not able to understand what the recursive function here does. input1 is a sample valid input I could figure out for the function. To get the crackme validated I need thstr to be MNGHCWZIJDXOPKLESUVTFYA in the end. How can I get the input to make that happen? I gave it a go. First I simplified your code a little bit. Now it looks like by the naming that stored is hardcoded in the binary. I considered MGNCHXWIZDJAOKPELYSFUTV to be as is and the target output to be MNGHCWZIJDXOPKLESUVTFYA. By the function it looks like that it takes the first char of input, splits stored at the location of that char and then recursively calls itself on the two parts made. I made a tree to follow that. 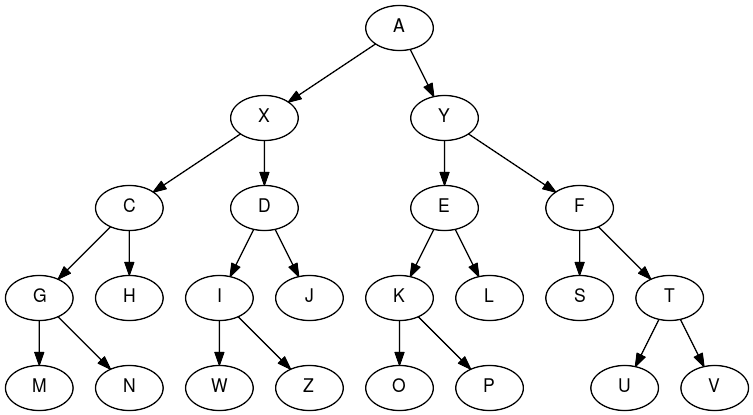 The graph is such that taking one char from input TFSLPOJZCGMNHWXIDAKEYUV and position nodes/chars which are at the right/left appropriately(V is right to T in the graph as it is right to T in the stored). 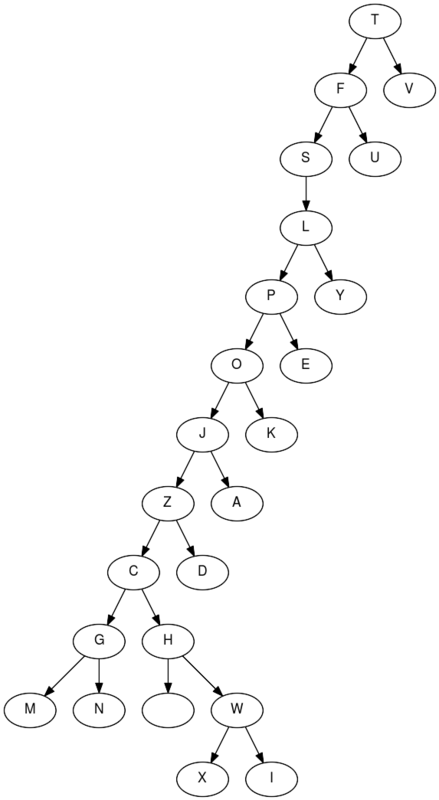 In this graph the output is post order traversal of the graph and the input is pre order traversal. Similar graph can be constructed from the target MNGHCWZIJDXOPKLESUVTFYA. Only the reverse such that post order is given and construct the graph. Now pre order traverse this graph and you'll have your input AXCGMNHDIWZJYEKOPLFSTUV. The equivalent hackish function is this. feel free to make it better. you say you wrote it and you can understand what you wrote ?? Not the answer you're looking for? Browse other questions tagged python crackme or ask your own question. Can a keygen be created for this protection algorithm?